Firefighters often have no idea what to expect when they bravely enter burning homes. That makes what they do even more amazing. These courageous men and women risk their lives to ensure that we make it out of terrible situations unscathed, and they also do their very best to save our four-legged friends. When this group of firefighters from Sandusky County, Ohio, rushed into a home that was engulfed in flames, they were greeted with cries for help. 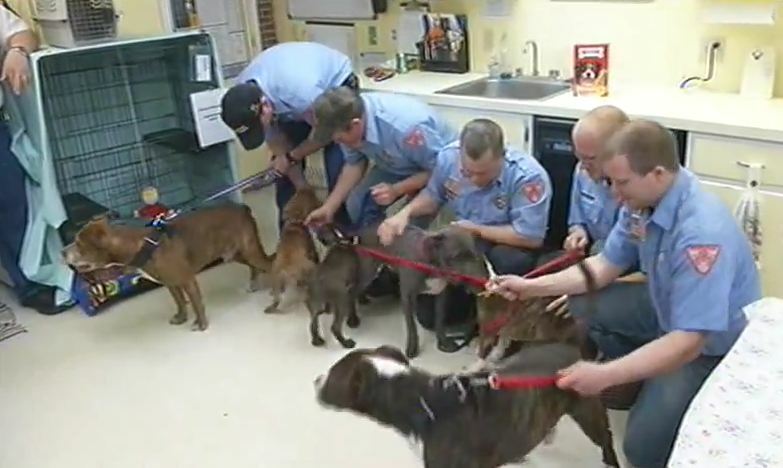 What they found were six terrified pit bulls trying to get to safety as the house began to fall down around them. Luckily, the firefighters got the three adults and three puppies out of there before anything happened to them. A few days later, the grateful pups had a chance to express their gratitude.